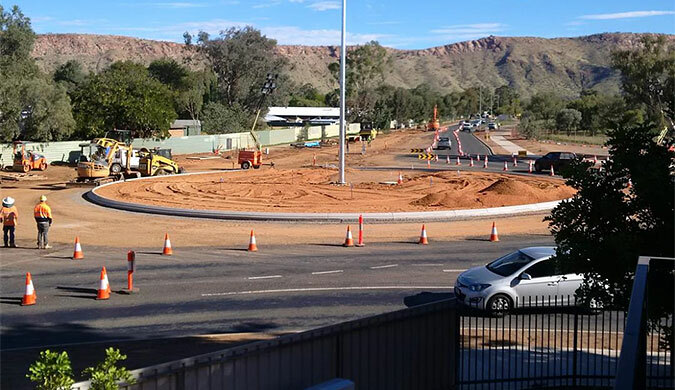 The completion of upgrade works at the Larapinta Road / Lovegrove Drive intersection in Alice Springs has improved safety and traffic flow and significantly reduced wait times for Lovegrove Drive turning traffic. The project followed a detailed intersection upgrade analysis in response to community requests following a number of collisions at the intersection. The $4 million intersection upgrade included the construction of a new single lane roundabout, asphalt resurfacing to provide a quieter road surface, improved lighting and the relocation of footpaths and services. Sustainable landscaping completed the project.